As you all know, I have had a heck of a time trying to find a concealer that covers up my ridiculous dark circles and doesn’t settle into the lines underneath my eyes. I have tried everything–or so I thought. I was at Sephora the other day and the consultant introduced me to Nars Radiant Creamy Concealer. I had never tried the radiant creamy concealer and was definitely skeptical about it. I totally noticed a difference the first day I wore the Nars concealer. I looked brighter under my eyes ( my dark circles were still showing, but definitely not as bad) and I had no cakeyness under my eyes. It went on pretty easy. I didn’t use the wand, instead I used a wet beauty blender which I swear by. Not only did the concealer work well under my eyes it also worked to cover some redness on my cheeks. I am about day 3 into the concealer and still like it. I am reading reviews on it and lots of people say its cakey but I definitely don’t think so. 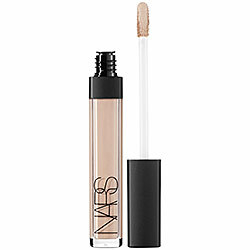 Nars Radiant Creamy Concealer gets one paw up–still need to determine if its a keeper. Next postBeauty Blenders – Love ’em or Leave ’em?